The ferris wheel we were working on center is 65 feet from the ground and had a radius of 50 feet. Located on the circumference of the ferris wheel is diver and his assistant who spin counterclockwise starting at 3:00 o’clock. A tub of water is constantly moving on a track that is parallel to the ferris wheel’s plane and moves on the ground. The tub starts 240 feet to the left of the center of the ferris wheel and the water in the tub is 8 feet from the ground. The divers assistant must determine the exact moment to release the diver from a platform suspended from a moving ferris wheel so that he lands in the tub of water. Here is where I will derive the formula I got for the Ferris Wheel Problem. RED = The first Part of the equation corresponds to the vertical position of the diver after t amount of seconds. You input a time in seconds and it will tell you at what high the diver with be. ORANGE = Multiplying the seconds we get with the speed of the tub gives us the distance it covers in the time the object is falling. BLUE = By adding it to 15t which is how much distance the tub covered while the ferris wheel was moving we get the total distance the tub will cover. PURPLE = When you plug in a time in seconds into the purple it gives you the horizontal position of where the diver will be after those many seconds. GREEN = We add 240 because that the total distance the tub has to cover and if we compare the divers distance with the tub we can get an exact number for when the diver should dive. When we solved the equation we got 12.2828 secs when they meet exactly in the middle. At around 13 secs the diver and tub would be perfectly one on top of the other but because of drop time we had to have the diver drop a slight bit earlier. How can we make the problem harder? I had an idea to make the problem happen on the moon which would make us have a different formula for the fall time. Because the gravitational pull is not as high as on earth it would be a harder problem. Overall I really enjoyed this problem a lot and I liked how many steps it took to have to get to the solution. When presented it seems pretty easy but because the falling time is too essential we had to do a lot of steps to make sure that our process was correct. 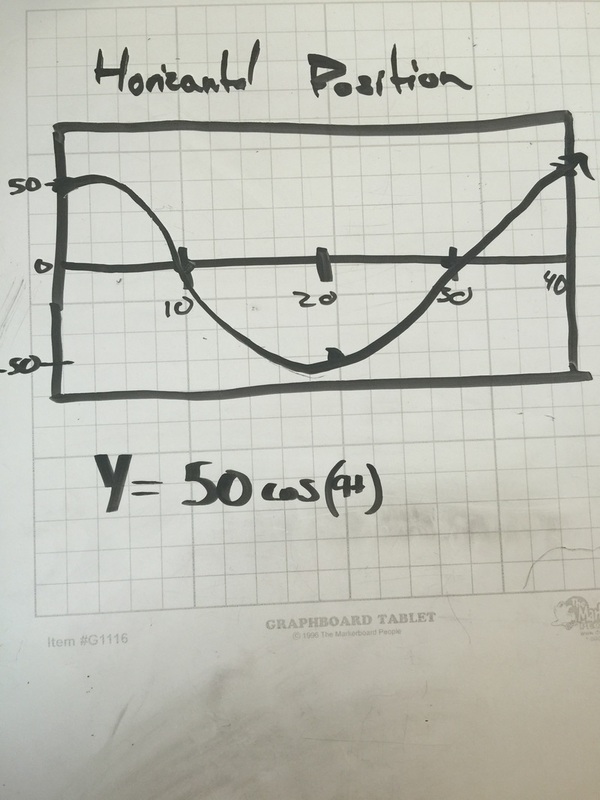 I worked hard on this problem because it intrigued me and I wanted to get to the answer. 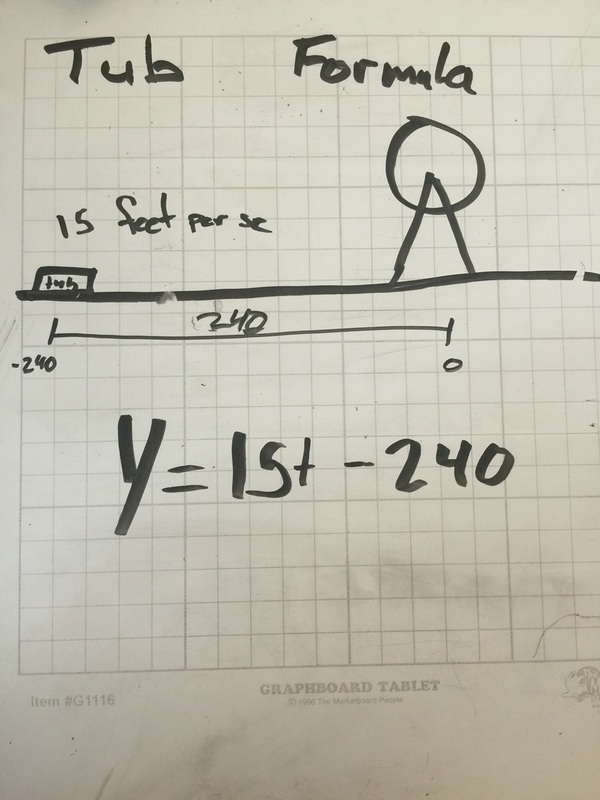 When I started on the problem I started a little slow but at the end I really wanted to solve it and have a step by step explanation on how to solve the ferris wheel problem. There are a number of people in a group. We will assign the variable “n” to the amount of people in that group. How likely is it that two people will share the same birthday? How many people do you need in a group so that the probability that two people will have the same birthday is 50%? How many birthdates are there in a regular year (not including leap year)? In a regular year, there are 365 possible birthdates. If my birthday is April 19th, and I meet a new person without the same birthday, how many other days of the year can they possibly have their birthday? A new person without my exact same birthday must have their birthday on 364 of the other days in the year. What about a third person? On what other possible days can this third person have their birthday so that it is not on the same as the me or the second person? Following the pattern, the third person can have their birthday on 363 of the 365 days in the year. The moment the problem was given to us I saw that there could be a formula I could come up with because when multiplying (364/365)*(363/365)*(363/365) and so on you see that in the numerator the numbers are being multiplied like a factorial. Multiplying 364 times all the numbers less than it. (exp. (354*363*362...) In the denominator you always have 365 being multiplied to itself.(exp. 365*365*365.... = 365^n. 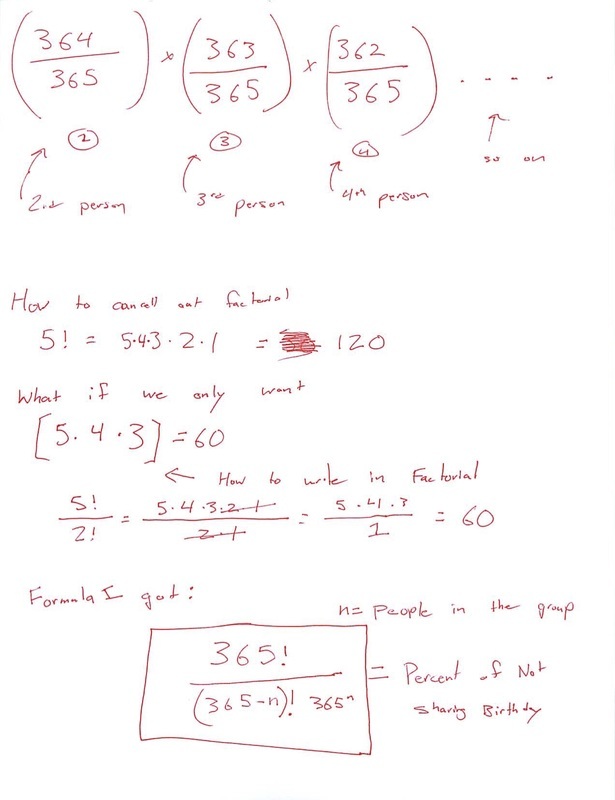 I used factorial to more easily multiply numbers with each other, to learn what will give us close to 50%. 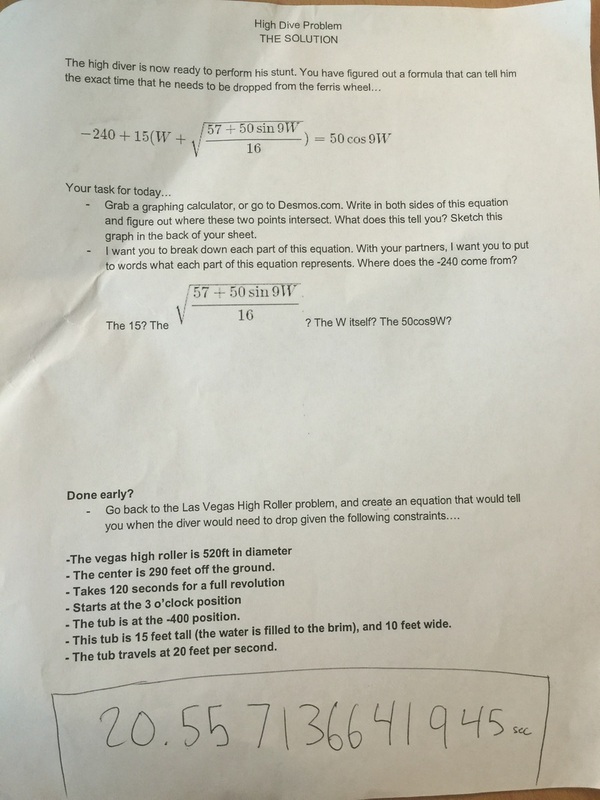 Mr. Tejeras walked us through how he got the answer after we came up with our own answers. His solution for the problem was the same one I got. 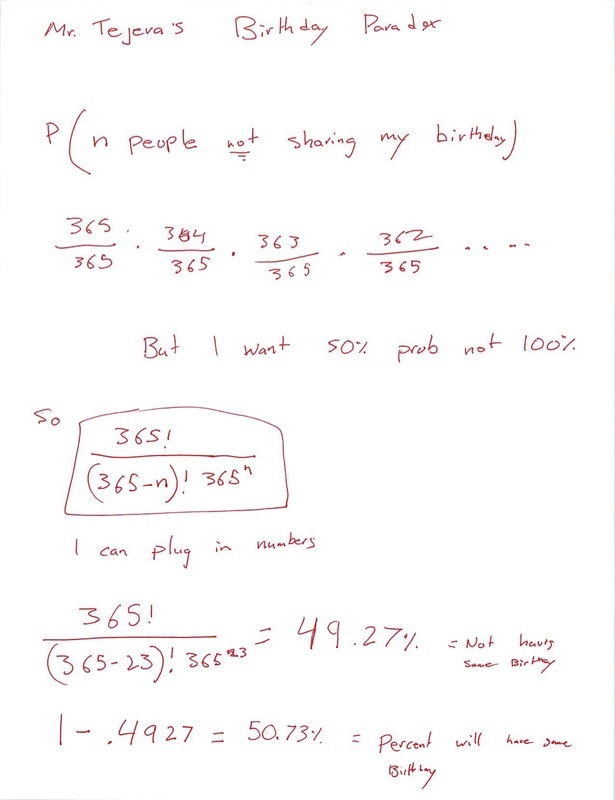 He has the same exact formula and calculated that at 23 people there is a 50% chance that two people will have the same birthday. For the extension I had to come up with how many people you needed in a group to have a 99% probability that two will have the same birthday. The solution I got for that one was 70 people, which blew my mind. 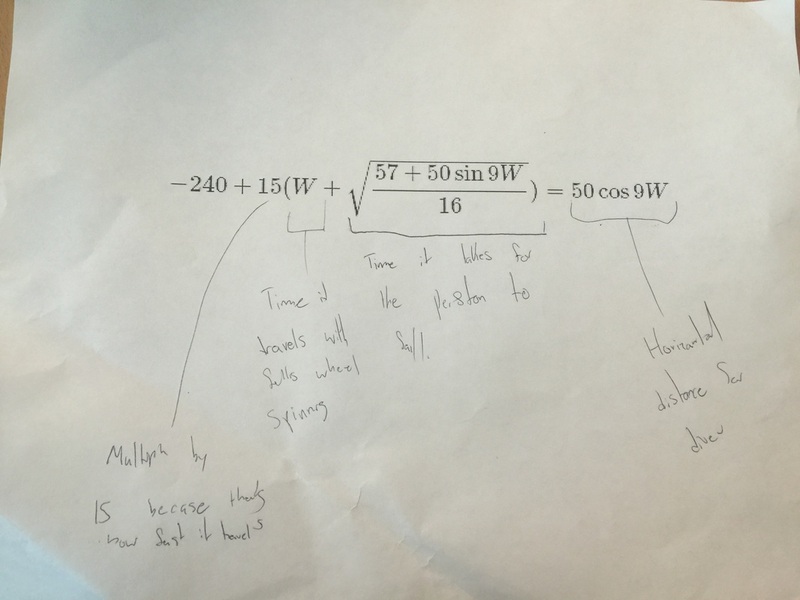 I really enjoyed working on this problem because it had a real interesting solution. It’s still hard to wrap my head around the solutions and how low a number of people it is. With a group of 23 people 50% of the time two people in the group will have the same birthday and in a group of 70 people 99% will have the same birthday. 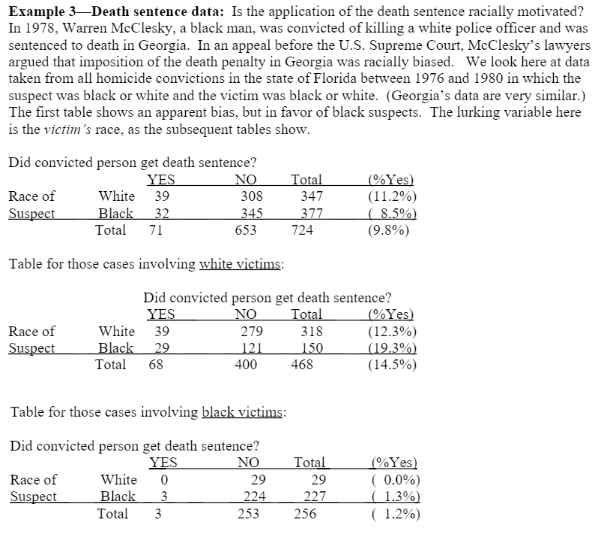 The problem we were working on asked “Is the application of the death sentence racially motivated?” We studied a case from Florida in which the lawyer of the suspect (black suspect who killed a white police officer) gathered information showing all the homicides which happened in Florida. The information had graphs that showed if the suspect was black or white and if the victim was black or white. In the actual court case, McClesky was given the death sentence and killed. The process I went through was study the graphs and see if the lawyer did have a good argument on stating that the death penalty is racially motivated. It was interesting to see where the Simpson's Paradox comes in when you analyze the data separately from white and black individuals than when the data is combined into one graph. 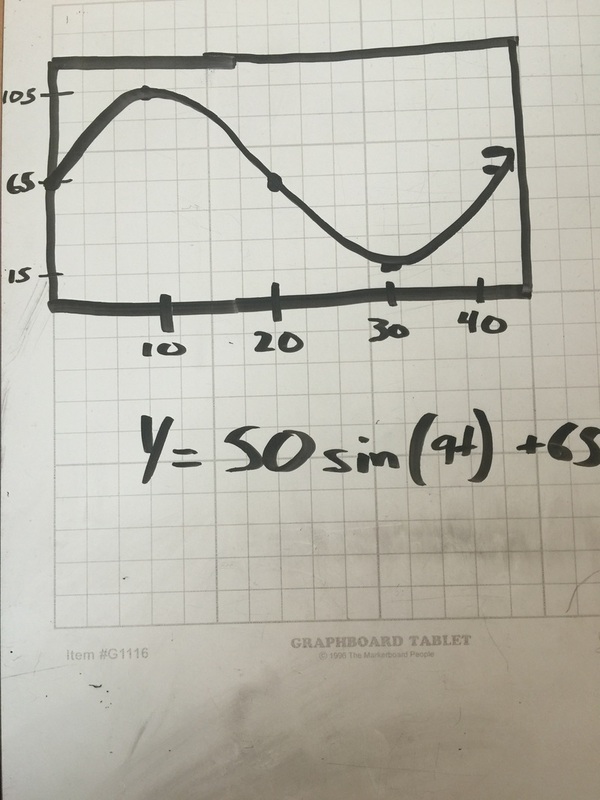 This changes the way the graphs look because in one you might think that it doesn't matter but then individually you can see that there is a difference. What I struggled with was trying to understand what the graphs were representing but once understood I was able to understand the data. If you look at the overall data with both black and white victims you can see that the data shows the white victims get the death penalty more often. On the other hand when you separate the data and see both graphs individually you can see that when the victim was white there is a higher death penalty for black individuals than the white. I also thought it was interesting that even if there was only 29 homicides that had a black victim and a white suspect, 0.0% of the suspects were given the death penalty. Other students also realized the change when looking at and comparing both graphs. We compared the entire two graphs combines to the white victim and black subject. You can surley see that when both tables are combined the table you get represents the data differently than when they are apart. My teacher observed the same similarities that I did with the data. He mentioned how when looking at the table that has both black and white victims on the same table it looks like when the suspect is white he gets sentenced to death more often than a black suspect but when you separate the data you see how it changed and you can tell that when the victim is white and the suspect is black almost 20% of the suspects get the death penalty. Also when looking at the cases with black victims only 1.2% of all suspects got sentenced to prison and no white suspect was sentenced to prison for killing a black person. The Simpson’s Paradox can really be present in most statistics we see on social media and adds. The paradox can skew the data and present it in a way that the presenter wants you to see it. The presenters of the statistic can therefore prove any point they want by “messing/playing” with the data. I really enjoyed this problem but mainly learning about the Simpson's Paradox because it's a topic that I had never learned at school and was never thought. It's something nice to carry around because you never know when you'll need to know about it. It was amazing to not only hear about it but actually see how the paradox works and some example problems of how they can affect the world we live in. Even though I was not there when the project was introduced to use because I was at the Jewish New Year holiday services, when I got the heard about the homework I read up all on the paradox and learned when it happens. Reading the explanation of how it happens really made it clear to me seeing the relationship between two separate graphs and what happens when you skew the data. i strongly believe I deserve an A+ for my work on this assignment and all the research I did for it.